In November 2014 Apple added a new tool to further increase the security of iOS devices. It’s called ACTIVATION LOCK STATUS. Activation Lock is turned on by default since the launch of iOS 7 and with iOS 8 it comes together with a new feature called Send Last Location (Settings – iCloud – Find My iPhone – Send Last Location) which transmits the last known location of an iOS device before the internet connection is cut off or the battery is empty. Many users, once they find out that their iOS device has been stolen, completely erase it from iCloud or another iOS device with Find My iPhone installed. Erasing of a device is followed by Activation. This feature forces users to enter the Apple ID and password associated with that device to regain access. The new web-based tool allows you to check whether a device is currently locked for activation or not. To use the tool, users are asked to enter an iOS device’s IMEI or Serial Number, which is then cross-checked with Apple’s internal database to ensure that Activation Lock is not currently turned on for that device. 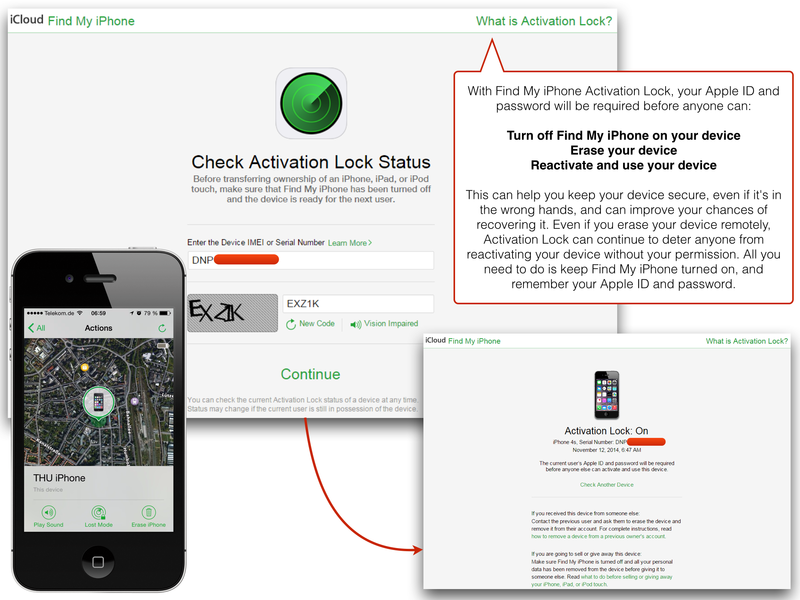 Activation Lock Status is a further sophisticated step to secure your Apple device.